When I suggested reducing the amount of SP in beta I only got as far as Crystal Caves. The reason was both the River and Crystal Caves were generally a bit easy. But some of those fights were already made tougher anyway, so reduction in SP wasn't really necessary, or at least not so much. Now I don't feel like I have enough SP for later fights. Be careful what you wish for because you might just get it. Also it seems to me the enemies could ease off the nets a bit in the tougher fights. Ok, finished the game. 5/8/7/6/8/6. My first and thus non iron man playtrough. Wanted to see if INT build was viable in pure combat game. 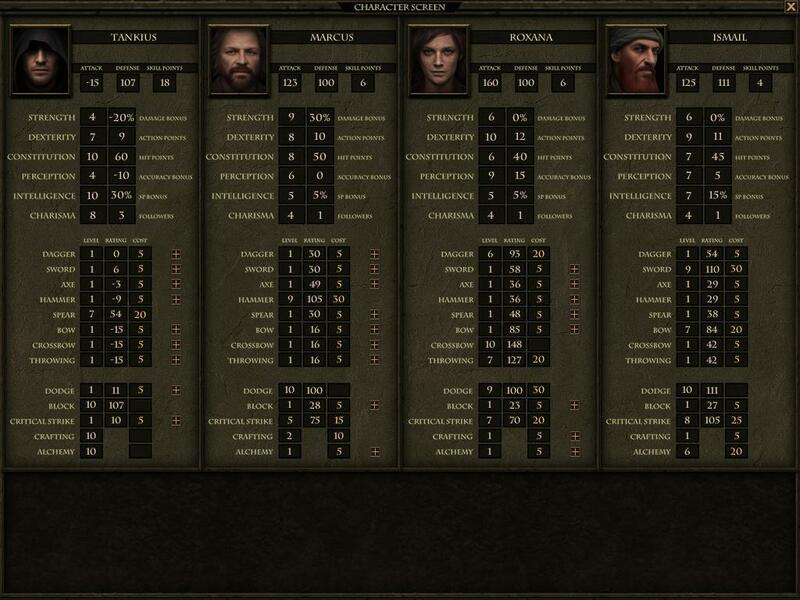 Companions - Marcus, Cyrus replaced by Hieron(crossbow) than replaced by Roxana (crossbow). The weapons of choice were sword and shield, as i never actually tried these in AoD, planning to focus on block and crib. 1) The sp progression felt weird. At character creation 80 sp seemed too much to distribute between 2-3 skills. Early to mid game is fine, but in the late game you hit the level 10 in both offense and defense ceiling way to soon, even with Marcus and his 5 INT. 2) INT feels like no-brainer dump stat in Dungeon Rats. In the end i had enough SP to max Sword, Block, CS and still had some points to pour some into daggers. But I still felt, that having PER and STR instead would be much better choice. 3) Hieron and Ismail were both completely capable to take care of my crafting and alchemy needs, despite the fact i used them mostly in camps. They come later, especialy Ismail, but I still had enough healing and liquid fire for my needs with just level 2 alchemy on Cyrus. So my main party completely ignored craft/alch and still benefited from it vastly. 4) Alchemy resources are so abundant that it throws the game balance out of the roof. In later harder fights I was frequently using multiple grenades AND liguid fires while keeping the entire gang nearly permanently on extended neuro stimulant and I still had more than grenades/fires in reserve in the end game. Having permanently poisoned weapons become norm since getting iron. 5) Crossbows are still the best weapons, overpowered as hell maybe even more than in AoD. Yes they now only cause stagger instead of knockdown. But they still allow you to dump STR and to lesser extent CON. Plus the new possibility to use belt slots without de-equipping main weapon boosted already excellent hand crossbow. Roxana with heavy crossbow and two hand crossbows as her side arms was capable to gun down hostile non-shield enemies even before they took their turn. Plus you can reload the ammunition of your choice in pre-combat phase. 6) I didn't like the constructs. The bronze/steel ones seemed pretty weak, the three sky metal ones on the other hand were ridiculously strong. They all seemed to share one weakness - no head armor. Barbed arrows should not be the best weapon against metal constructs. Thinking about it the Emperor should also consider wearing a helmet, as the combination of grenades, nets, liquid fires and headshots prevented him from doing single swing. As you can see I'm doing a 4-5-4-8-10-9 run and currently have lots (206) of unused SP that weren't necessary to use so far. I will go after Emperor next so I might have to use them but I can tell you this now - if you nerf crossbows a build like that won't be viable any more which would be a waste because it's such a fun build. With such low DEX you have to use completely different tactics and there's no way to cheese through fights, especially in the beginning. I had to sacrifice EVERYONE on rock bottom + Hieron to even get to Reinard and the fight with him took me about an hour (once I started to use alchemy it took me only a couple of tries but I was trying to save neurostimulants and bombs for later). With 7AP you can't hit and run, can't find chokepoints (because before you'll get there you'll be dead, or someone of your team will) and in general you're handicapped. But like I said it's lots of fun and poses quite a challenge. It's not iron-man level of course but for those who finished the game a couple of times a build like this will be definitely enjoyable. So I'm against crossbow nerfing. To my surprise, I defeated some very tough opponents quite easily (e.g. Scaurus on first try) but that's because followers made most of the work. Solo a build like this would be impossible. Also, nerfing crossbows might also make iron man harder and it should be doable, so far I don't think that anyone managed to do it (despite the Steam achievements indicating otherwise). The main problem of high INT built that unlike in AoD the extra SP doesn't really matter. If you can get 10/10 with int 4, than you don't really need higher INT. In practice you will struggle in the start due to subpar physical stats. Than for a brief window the extra sp will kick in giving you an edge and somehow balancing the fact that you have less HP AP and DMG. Yet in late mid game you will hit the 10 and the extra sp will go to synergies which isn't realy worth it. Yes the build can be fun, but that's because you gimped yourself and you need to rely on your companions. If you made 4 int 10 CHA crossbow build, he would be most likely significantly stronger. The situation would be different if the extra INT would allow you to reliably get a skill you can't get otherwise. Yet in my 8 INT, 6 cha playtrough I was unable to keep up my 3rd skill (CS) on par with my main combat skills until the point when i hit the maximums. Finished the game on hard with 4/6/4/6/10/10 (not counting the bonus points from healing machine) with sword, shield, crafting and alchemy. Got just enough sp for sword 9, block 10, crafting 10 and alchemy 4 before the last fight. Could have gotten the sword to 10 if i didnt pick alchemy (i relied on Ismail for all my alchemy needs after i've got him) but considering that my character usually didn't do much damage with his sword throughout the game i might have as well dropped sword instead of alchemy. Regarding the difficulty of fights i think the archers, crossbowmen and throwers are kinda too strong. Not sure what i't do without taking most of the shots with my main character in imperial armor and with tower shield. Especially these sky metal ranged constructs totally shreded all my companions with dodge in 1-2 turns (recruitable construct would have probably dealt with them just fine though, if i'd taken it into that fight). So i'll have to stick with shields for my solo runs as well i guess, even though i would have prefered to try dodge. Can't deal with archer in barka's camp on my first solo run though, even with block 8 he hits me pretty often. "Best weapons"? No. Definitely not. They are very cost effective (as they are meant to be), but they are only good for hybrid (high CHA) characters. As a dedicated ranged character with low-mid CHA, I would definitely pick either bow or throwing over xbow. Also, tho it is undeniable that the new belt system benefits xbowmen, it does the same for archers and everyone else, including melee characters. Yes, including melee characters since you can craft a low AP version of your main weapon to avoid wasting leftover AP. I think the biggest issue with the meteorite constructs is the fact that they take one billion attacks per turn and they ALL seem to have a very high CS score, which means that even if you surpass their CS score with your vsCS, their MINIMAL CCS is STILL very scary. I got crited 3 times by the crossbow construct while wearing steel imperial armor + tower shield with maximum CON. Can't do any better than that, sadly. I won after a reload but...WTF?! Not really. I finished the game 3 or 4 times already and my only gripe is the fact that the meteorite constructs are guaranteed Ironman destroyers. And I hesitate to call for a nerf because I have yet to try another tactic I've been theorizing. 1. Throwing is super gimped on the first level, quickly run out despite the stones and crafting the wooden javelins. Had to take bow skill points to get by as there was a near unlimited supply of arrows. It's also really weak to start off with, which is fine because of how much better it is than bow and crossbow at higher levels. But at least give us a enough throwing resources on the first level. Also I think the crafting requirements for the heavy throwing weapons should be lowered from 1 pound each to perhaps 0.5 pounds. One pound each is very uneconomical especially on the first few levels where metal is scant. The later levels are not so much of an issue. 2. Roxane is too strong when you get her, she completely eclipsed my party of Marcus and Quintins in terms of skill points. Not only Hybrids benefit from the stat dump allowance of crossbows. Solo xbow build can afford to do the ultimate min maxing of 4/10/10/10/4/2 for best accuracy, dodge, AP and HP in the game. The Hand crossbow is the main balance offender. It reloads for 3 which puts it on speed parity with the fastest bow. It occupies only hand and can be placed into belt slot. Also for some mystical reasons it can fire in melee. All xbows shoots for 2 AP with separate reloading which gives you extreme versatily. You can choose to when reload and which xbow. This adds trendemous adaptability not available for other builds. For example - Roxana under Imzail made neurostimulant could start her turn with 1 regular or torso shot from heavy crossbow, followed by 2 headshots from hand xbow, than followed by swapping out one hand xbow and throwing 2 vials of liquid fire. Try doing that with bow. EDIT: agree with huckc - Roxanne indeed eclipses all non CHA locked characters, including the PC. And deep in the mine it should be virtualy impossible to run out of stones to throw. Some of the end-game ranged enemies are ridiculous on hard. The crossbow constructs and the archers in the final battle were ripping my 10 block Tower Shield meteor armor tank to shreds. Perhaps your armor penalty was too high? Well, you were using Crafting 10 tower shields, so you should have had like 0 THC Malus. What was your exact build again (screenshot)? I recall finding the fight fairly easy with a block based character and Crafting 10 tower shield. I'm thinking it's a combination of a lack of STR bonus to block and the 20 armor penalty. Even with a partial block, I would still eat 10-15 damage from Nordom's bolts. The healing chamber fight is definitely the hardest, then dual Modron fight before it, then Scaurus, then the quad centipede fight, then the Emperor, then the finale. I did go full out with berserk potions and stims in the finale though. Yes, Tankius was a complete pacifist! Body count: 0! The INT 10 was definitely useless though. Doesn't armor penalty apply to dodge only? No, it applies to both dodge and block, which makes block even more fragile than dodge, because blockers have to face attacker during block and this exposes their backs for +25% THC against them. So solo run with block is entirely impossible. Looking at stats, there's yet another reason why Roxana's ranged is so good: her throwing and crossbow skills synergize, giving her a huge THC boost.